Our noble, typically Bavarian pils is known for its fine, selected hop-bitter and its refreshing taste. In fact, fine Hallertauer aromatic hops make it possible to enjoy a second or third pils. 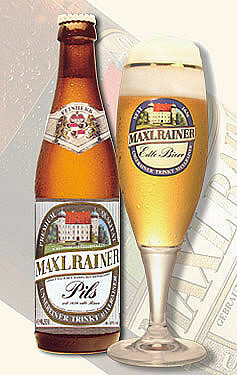 The “premium quality" Pils Maxlrainer is one of the classical Maxlrainer beer specialties and is available in elegant 0.33-liter bottle. This classic beer has been a long time recipient of DLG awards. UPDATED: SEP 10, 2018 Flasche gekauft bei Bierlinie in Berlin. Sehr helles Gold-gelb, klar, viel Kohlensäure, wenig kleinporiger Schaum. Aroma: säuerlich, Zitrushopfen, klassisches Pilsaroma. Geschmack: würziger Antrunk, etwas Zitrus, Getreide, weniger bitter. 330 ml bottle. Bright golden, decent head. Floral, grainy, hoppy, metallic and citric aroma. Crispy bitterness. Light bodied, nicely carbonated. Bitter-metallic finish. Nice bavarian Pils. 0,33l Flasche. Gelb und klar, weisser fester Schaum. So muss ein Pils aussehen. In der Nase Honig und Getreide. Kräftig herber kerniger Antrunk. Schönes Pulsaroma. Echt klassisch. Langer bitterer grasiger Abgang . Gefällt mir. Bottle. Light golden, small to average and mostly diminishing head. Light to moderate malty - lightly grainy and dryish - lightly sweetish aroma, light - some herbal/grassy hoppyness, faint metal. Body is light to medium, malty and lightly sweetish flavor, light metal and herbal hoppyness. Finish is average, malty - lightly grainy and dryish, light - some metal and light herbal/grassy hoppyness. Dryish pils with sharp metal in the finish. Nice hoppy aroma though. Klare goldgelbe Farbe, ordentliche weiße Schaumkrone. Geruch getreidig, hopfig, leicht würzig. Geschmack würzig malzig, grasig hopfig, ordentlich gehopft, gutes Pils! Bottle looks really good. Beer in the glass zippy, small head. Starts mild, malty, modest dry. Light hoppy background. Finish a bit metallically. Okay.